Born at Parkhill, Ontario in 1889, and was called to the Ontario bar in 1911. Arriving in Manitoba later that year, he lectured at the Manitoba Law School from 1915 to 1934. He was a prominent member of the Committee of 1,000 in 1919. He was active in drafting the Canadian Bar Association’s canon of legal ethnics in 1920, and he taught at the Manitoba Law School for most of his professional years. In 1921 he published Canadian Law of Landlord and Tenant, which became a landmark Canadian legal textbook. A non-driver, he drafted a Highway Traffic Act, which was the first comprehensive motor vehicle statute in Canada, in 1930. He also chaired a committee that in 1939 produced new rules for the Court of King’s Bench. 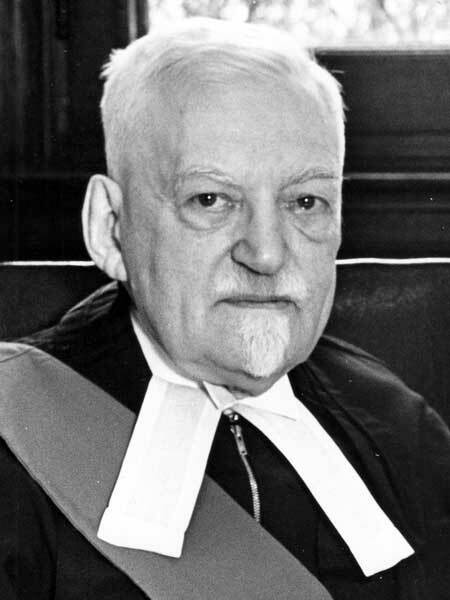 He served as President of the Law Society of Manitoba from 1941 to 1943. He served as chief counsel for the Royal Commission on Espionage that was appointed in 1946 to investigate the charges by Igor Gouzenko, and he recommended procedures highly criticized by civil libertarians. Soon after, he was appointed chief justice of the Court of King’s Bench over considerable local opposition because he was not a Liberal. As a judge, Williams was a stickler for form and tradition, introducing coloured gowns and sashes for judges in 1949. Between 1947 and 1951 he tried five men charged with murder, and sentenced all of them to be hanged. He was a member of the Board of Trustees at the Manitoba Law School (now the Faculty of Law at University of Manitoba) from 1938, and Chair of the Board until his retirement in 1946. He also served as a member of the Senate of the University of Manitoba. He was given an honorary doctorate in 1953. Williams was outspoken against communism, and a staunch advocate of bilingualism, seeing it as step toward national unity. He was a voracious reader, acquiring a library of over 10,000 books on wide range of topics. Williams retired unexpectedly, in ill health, in 1962. He died in England on 30 April 1970, at the age of 80 years. He is commemorated in the name of the University of Manitoba’s Law Library. His extensive papers are at the Archives of Manitoba.